When the people in Joan Didion’s life die, it’s the kind of thing that makes the news. Niece, before the release of the biggest movie she will live to make, “Poltergeist,” strangled by an ex-boyfriend. Husband dies of a heart attack, and Didion’s account of it wins a National Book Award. Her brother-in-law, bladder cancer, famous first for his career in the movie biz and later for his opinions on the crimes of the major players, makes national news when he dies. 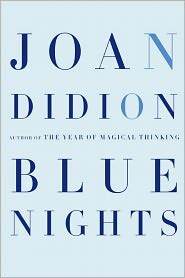 So the whole time I'm reading Blue Nights, Didion’s memoir following the death of her daughter Quintana Roo, I’m wondering: Who is your emergency contact, Joan? And all I can see is the face of Griffin Dunne, her nephew, as his face appeared in “American Werewolf in London.” I can't separate the person from the character, so I groan. That guy, huh. That guy. Didion addresses the matter herself in the late pages of the book: Her brother, maybe. But he lives 3,000 miles away. Griffin, as I predicted, but at the time of “In Case of Emergency” crisis, he is filming on location, close friends in New York City, though the closest now lives outside of the city limits. You don't worry about Joan Didion, 76, living alone in New York City. That's preposterous. But still. Didion’s memoir, which follows the equally grim circumstances of her husband’s death The Year of Magical Thinking, is a short collections of memories of her daughter and Didion's realizations that the last time she sees so many people is when she visits them in the ICU. Didion and her husband John Gregory Dunne adopted Quintana Roo when she was fresh from the oven. The doctor called, said he had a baby, and they went straight to the hospital. They named her for a spot they had seen on a map once. Her childhood, like all childhoods, shows evidence of her parent's lifestyle: After a movie release, Quintana's opinion isn't “good” or “bad,” it’s that the movie is going to be a big hit. When she is five years old, she calls a film studio and asks how to be a star and calls a mental hospital and asks what to do if she thinks she's going crazy. You can feel Didion circling the topic in the pages of this short memoir. She doesn't really get to the meat of her daughter until late. As is her strength, she continues remembering certain details: a plumeria flower tattoo that shows through her wedding dress, her hair filled with flowers. There is no “Let me tell you about my dead daughter” manipulation. Instead she writes about people — others who have died — and places — the houses where they lived, even her own health, with Quintana on the peripheral of all of it. She shoots for a goal of momentum in the aftermath, assuming that jetting off from here to there is momentum, but finds it is not. Didion holds off on kicking readers in the cry place until the book;s final pages when The Year of Magical Thinkinghas been turned into a play starring Vanessa Redgrave. Didion spends time backstage, they make a joke of the meals she takes at a small table and call it a cafe named for her. She finds comfort in the dead being talked about, their words on the stage. On the final night of the run, she finds it hard to leave. Yowch. Joan Didion is my Beatles and Rolling Stones, and I'm starting to, selfishly, worry about her. One moment finds here sitting in a folding chair, paralyzed, unable to get up from the chair. The words don't come as easily anymore, she admits.